"In the process of installing the exhibition Michael Chow aka Zhou Yinghua: Voice for My Father at the Andy Warhol Museum, my thoughts have turned to abstraction with new direction. (Example above left.) 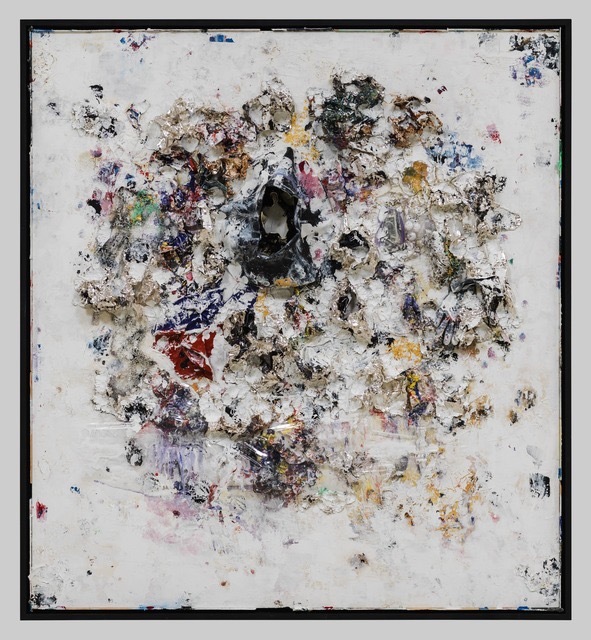 Chow works with large-scale abstraction and engages mixed materials, including precious metals, house paint, and even trash. With densely layered surfaces and contrasting textures, Chow's paintings have an intense, almost violent energy. In this competition, the painting Happiness by Barbara Mink caught my attention. Her palette of muted pastels creates a sense of levity that I found fascinating and sophisticated. There was an overall sense of softness and warmth in her canvas, qualities which are not usually used to describe abstraction. The genre of abstract painting has a longstanding, mostly masculine, place within the history of art, and it was refreshing to see a feminine perspective on this tradition. Mink found a balance between color and material that leads to an overall sense of harmony in her work. " I had never heard of Chow before, and am glad I've been "introduced." In looking at the two images above, and at the work of women who were working during the fifties and sixties heyday of abstract expressionism (Frankenthaler, Krasner) or contemporary colleagues (Melissa Zarem in Ithaca) I don't see palettes, energy or gestures that are terribly from male contemporaries. So it's interesting to think about the framework, both historical and current, within which we view things.